Westmont Fire Chief Dave Weiss has been making a big difference in one local boy’s life. Weiss has been committing his spare time to help bring a smile to Braden Kubish’s face. Over the past several years, Braden, now 9 years old, endured several life-threatening situations including the removal of a brain tumor. Currently, he is going through Leukemia treatment. Braden and Chief Weiss became friends through the Make-A-Wish Foundation. “Ever since Braden got to eat lunch with the firefighters and tour the Fire Department Headquarters, all he talks about is how nice everyone was at the Fire Department,” said Jenny Babyar, who volunteers as a Wish Granter through the Make-A-Wish Foundation. “He especially enjoys spending time with Chief Weiss and his family,” Babyar continued. Chief Weiss recently went to Central DuPage Hospital to visit Braden on his last day of chemotherapy before his maintenance phase. “I was so excited to see him,” said Braden. “I was shocked actually! 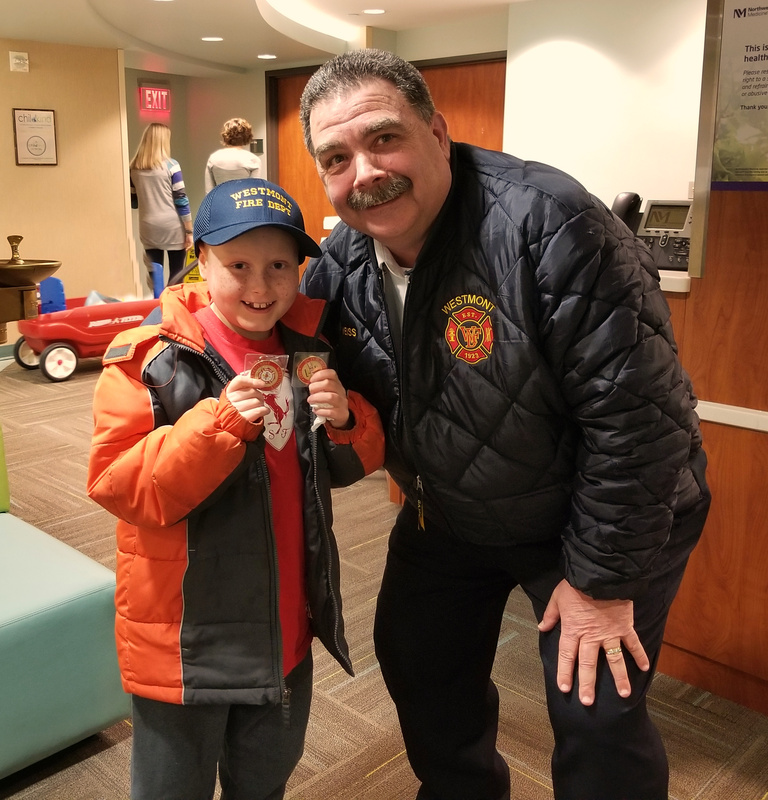 It made me feel good because I know that I’m much closer to being done with treatment, ” Chief Weiss also surprised Braden with a Westmont Fire Department Challenge Coins and a Hat. Back in November, Babyar and Weiss invited Braden to be part of the Westmont Holly Days Parade and ride on one of the fire trucks with Chief’s family.